I have a real admiration for collards and other greens because they are survivors. Tomatoes, eggplants, and other warm-weather vegetables are delicious, of course, but they have it easy, basking in the sun all day and not being expected to withstand repeated freezes. And while Mississippi isn’t exactly known for its cold weather, this year, like much of the country, we experienced one of the harshest winters on record. At the coldest point, the temperature stayed below freezing for days on end, breaking waterlines in the city where I live, shutting down schools and leaving us without drinking water for about a week. Since December, it’s snowed more times that I can remember, which is amazing when you realize that we usually see snow maybe once every 5 years, so we remember even the faintest flurry by the year it happened, not the month. That’s how they looked right after the coldest weather, before I started stealing some of their largest leaves to cook with. That’s another great thing about collards; unlike head lettuces or cabbages, you can cut off what you need, and the plant will keep growing. When the weather really starts to get warm, the collard’s central stem shoots up and sprouts clusters of florets that look a little like broccoli. Eventually those florets bloom into little yellow flowers, which are pretty, yes, but signal the end of the growing season for the collards. The leaves become more bitter once the plant has flowered, so I try to harvest the leaves before that can happen. In this I almost never succeed. Currently my collards have stalks about 4 feet tall and more flowers than leaves. 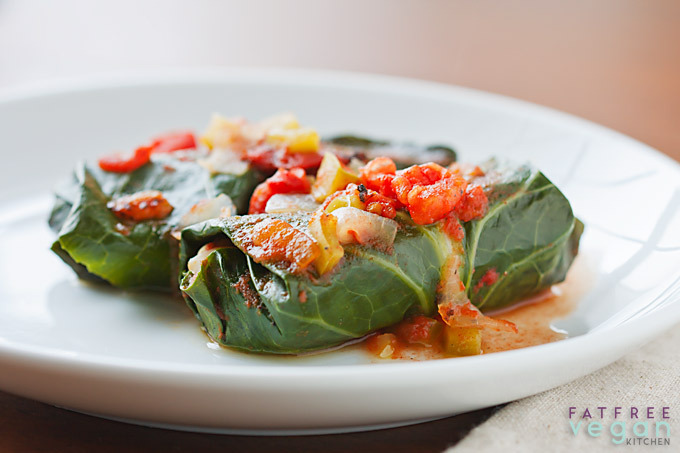 If collard greens aren’t available, you can use large cabbage leaves to make this recipe. You will need cooked rice and red beans, so before you do anything else, make sure you have those prepared. I pressure-cooked 1 cup of small red beans for 25 minutes (natural pressure release) and had about 3/4 cup of beans leftover after making this recipe. Heat a large non-stick skillet over medium-high heat. Spray or wipe it with olive oil, if you like. Add the onion and a pinch of salt, and cook, stirring regularly, until it begins to brown. Add the green pepper and celery and cook, adding a little water if it starts to dry out, until the vegetables are tender. Add the garlic and cook for another minute. Remove 3/4 of a cup of the vegetables from the skillet and mix them in a bowl with the fire-roasted tomatoes and a little salt and pepper to taste. Set aside. To the skillet, add the rice, red beans, the seasonings, and 1/4 cup of bean-cooking liquid or vegetable broth. Reduce heat to very low and cook for about 10 minutes, stirring regularly and adding additional liquid if it starts to dry out. Remove from heat. Meanwhile, bring a large pot of water to boil. Wash the collard leaves and cut off the stems level with the bottom of the leaves. Turn them with the coarse stem-side of the leaf up, and holding a very sharp knife parallel to the leaf, trim off part of the thickened central rib. Be careful not to cut through the leaves. If leaves are very large, you can just cut out the thickest part of the central rib. In two batches of 6, place the collard leaves into the boiling water, pressing them down gently to make sure all leaves are submerged. Boil for 3 minutes. Remove with a slotted spoon and rinse in cool water. Repeat with remaining leaves. To assemble, spoon half of the tomato mixture into the bottom of a long, oiled casserole dish. Place a collard leaf in front of you, trimmed side up and stem closest to you. Place about 2-3 tablespoons of the rice mixture (2 for small leaves, 3 for larger) about a quarter of the way from the bottom. Fold the side edges over the middle. Fold the bottom (stem end) over the filling, tucking it in behind the filling. 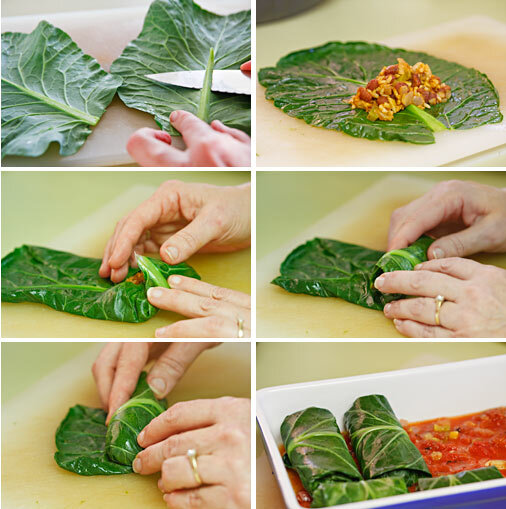 Roll up tightly, and place each roll into the casserole dish. Spoon the remaining tomato mixture over the rolls, and cover the baking dish tightly with aluminum foil. Bake at 350 for 40 minutes. Serve hot. One serving of two rolls is 1 point on Weight Watchers Freestyle program. I made this last night and it turned out wonderful!! My boyfriend has agreed to start eating 100% vegan in our house so I’ve been trying to find new and exciting recipes to keep him interested. I had never eaten collards before and was a little scared I wouldn’t like them but I loved the flavor of this dish. My boyfriend ate two servings and requested that I make this again sometime soon. Thanks for such a healthy and satisfying meal!! YUM! This was delicious! One of the best fat free vegan recipes I’ve ever tried. I used sweet cabbage leaves from our farmer’s market, as I’m not a big collard fan. Also used less ‘hot stuff’ and let those who like it hotter add their own. This weekend we’re fixing it for guests with beet greens. This goes in the favorites file for sure! I made these tonight and they were delicious! 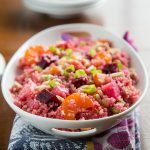 I substituted quinoa for the brown rice – yummy! Definitely loved this dish. Used Turnip Greens instead (it’s what we had on hand) and it turned out well. It wasn’t difficult to make and I had fun wrapping while my boyfriend spooned. 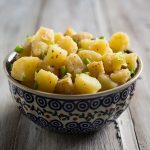 Love love love this blog and especially this recipe. You’re an artist! Thanks for all your work. 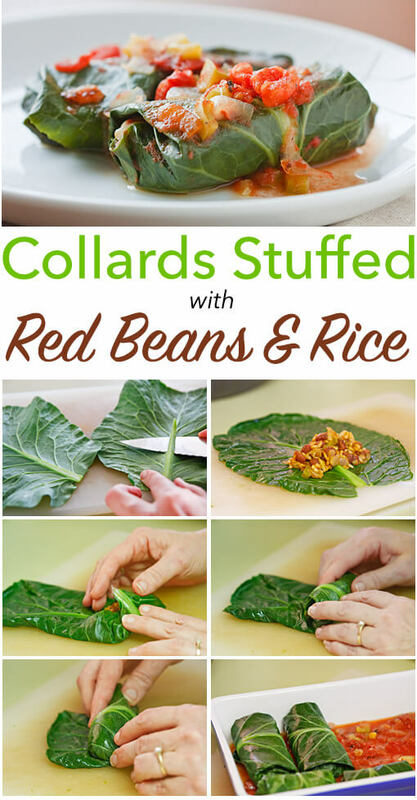 I left a comment on this rccipe before the change over, but I guess it didn’t make it. . I’ve been revisitng it because I am thinking about making it, or making some version of it, and also because your collards are just SO beautiful. They must be delicious. Your photos of them are scrumptious, too. 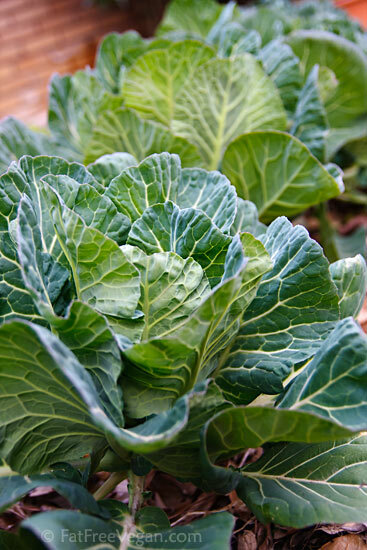 It is not common to find collards like that up in Idaho, so I may have to use cabbage when I get to this recipe. But the even the sight of them in your pictures cheers me up. Would it be ok to substitute a red bell pepper for the green? It’ll be a little milder but still delicious. Enjoy! This looks great! Can’t wait to try it for dinner! Question….do you use 1 cup of rice already cooked or 1 cup of rice that you then cook? It’s a cup of cooked rice. The easiest way to do it is to make a pot of rice and then just measure out 1 cup for this dish. I filed this recipe away awhile ago and am just now getting around to trying it. Delicious! Great recipe! 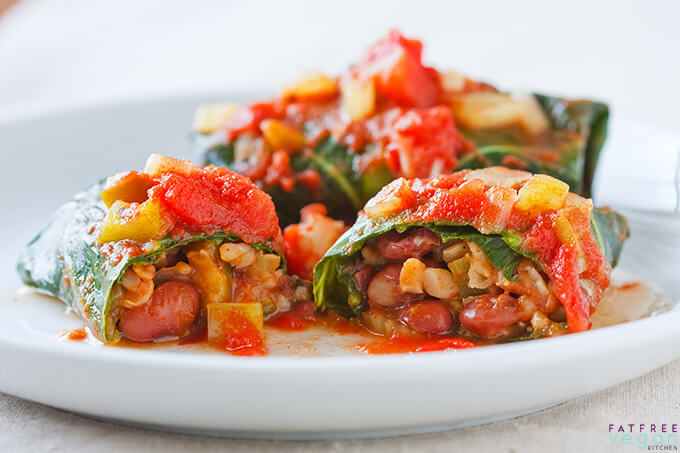 This looks like a nice vegan recipe – love beans, rice, greens, tomato, so I’ll give it a try. Regarding cooking beans – you do not need to presoak any dried bean if you use a pressure cooker. I’m not sure why, but they all turn out great. Maybe the pressure is so intense it breaks down the chemicals that upset your gut. I have a great recipe book called “Pressure Perfect” by Lorna Sass that has charts showing cooking times for beans, vegies, grains & meat. Although it includes recipes with meat I read that Lorna is actually vegetarian, so there are vegetarian versions of most recipes in the book. I made this the other night and it was fantastic! used up a lot less dishes than I usually use on cajun style beans, rice and collards. Even my picky fiancee liked it. They were better the next day too. Have you had any luck freezing these and using them later? It would be great if I could freeze some and pop them in the oven for a quick dinner. These were wonderful! Just finished eating them for dinner. The colors of this dish are great, I added some slices of patty pan squash for white down the middle of the pan and it was beautiful. Almost too beautiful to eat. The collards were easy to stuff and the rolling went fast. I only steamed those leaves for 1 minute and they were perfect for working with. Thanks for a great dinner recipe. Oops, I forgot to add that I am interested in hearing if these yummy babies freeze well, too. Would be nice to have them as a quick meal, just heating them from the freezer. I can’t see any reason why they wouldn’t freeze well, except the collards may get softer. I’m glad to hear you liked them, and the patty pan slices sound like a great idea. I made this tonight and used quinoa instead of the rice and cabbage instead of collards. The rest of the recipe I followed as per the instructions. This was a great meal for a cold night. Even my picky Mr. Wonderful loved it, which is a feat! Finally, at our food co-op up here in Idaho, there were collards that were worthy of this kind of tratment. I have not been able to get these beautiful photos out of my head since I first saw them. so I bought the collards, intending to try this recipe. But then I had cooked some dried fava beans grown by my neighbor (an adventure), peeled all the skins off, and made a thick baked artichoke type dip with them, inspired by Karina’s artichoke dip, but using the beans instead of mayo. Well, it’s really a whole different recipe in its own right, but that’s where I got the idea. So, I started wondering if I could stuff the collards with that and some veggies for lunch. I tried it too ways, and like both. One was more raw, just soaking the collards in warm water and vinegar. And the other was to blanch them as you did, and then put the filling in, but in the end I decided not to bake them, just eat them like that. I loved them. I’ve also been doing an Asian inspired wrap stuffed with mashed millet and cauliflower and then dipped in a version of your miso sauce that has curry paste and a little peanut butter in it. Heaven! I just loved the bright green color of the just blanched collards so much that I couldn’t bring myself to bake them in a sauce. Maybe some day I’ll go all the way with the original recipe. At any rate, thanks for inspiring me with these beautiful photos of your collards and this wonderful recipe. We had this tonight and it was excellent. My husband didn’t even mind all the preperation, he said after he makes it a few more times it will go alot quicker. We ran out of cayenne pepper so he used Chipotle Chili powder which gave it a little bit of a smokey taste. 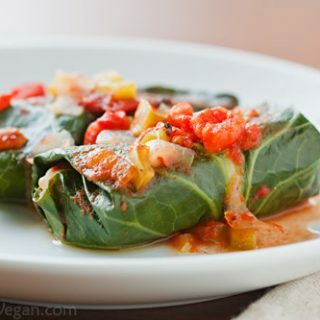 What a great way to eat collard greens. We never had them any other way than steamed and we didn’t like them. No bitter taste. My husband loved your pictures and blog as well. These are excellent!! I had 2 bunches of collards from my Co-op box so I decided to try this recipe. But what made it even better.. my kids AND husband loved it! My 6 yr old ate 7 rolls. Next time I will have to make 2 pans. These look lovely, but the calories seem to be missing from the nutritional information. Any ideas as to how many calories per serving? I’d love to incorporate this dish into my diet plan, but cannot without that information. Thanks. Thanks for pointing that out. They contain 144 calories peer serving. I am re-creating this dish, in an effort to go more meat free – may I repost (with a link to your recipe) on my blog? Thank you. Thank you so much for this post! 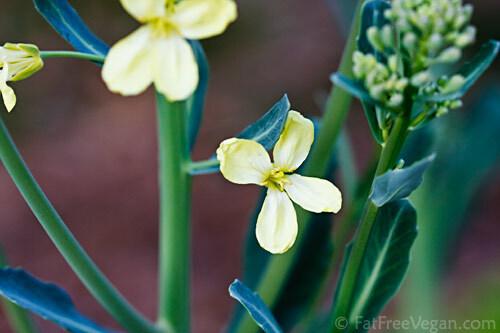 I have been trying to come up with creative ways to use up our collards before they flowered, and happened upon your blog. 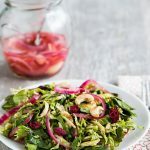 I followed the recipe fairly closely, just made a few changes based on what I had on hand in our pantry. My Georgia born husband proclaimed the result “fit for a family dinner with my mother”. That is quite a compliment! Thanks again, and keep on with the great recipes! I made this today for lunch as I had some collards in my fridge to use up before our next CSA box arrived. I accidentally added more cayenne than I was supposed to (confused it with the paprika jar) but it still came out amazing. My husband (the skoville fan in the house) ate most of it and wants me to make that mistake each time. Great recipe! I also used aduki beans as my store was out of small red kidneys. Totally delicious! 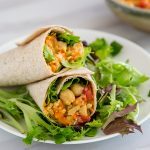 I love these vegetable burritos! Oh my! These are so very good. I made them for a dinner with an old friend who loves collards. They were good the night I made them, but after three days (the time they stayed in the fridge before I ate one again), they were amazing. The flavor had really set in and developed. So tasty. These came out wonderful. I will definitely make them again. In my opinion they are tasty and pretty enough for company. Thank you! Just made these for dinner, they were very tasty! I love steeling your recipes! Can I collect damaged leaves and chop them in smaller pieces dry them and use them for mulch over garlic for potassium for those Garlic?